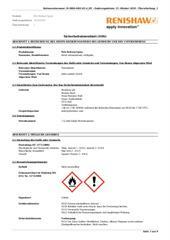 A Safety Data Sheet (SDS) describing the hazards inherent in Poly Release Spray. A data sheet describing the characteristics of Poly release spray used to coat metal mould inserts in silicone vacuum casting moulds. A data sheet describing the handling processes and physical characteristics of silicone rubber VTV 740.